Before starting the Walking Eagle News in November 2017 and becoming what he calls a “pretend journalist”, Fontaine’s career began in Saskatchewan as a freelance writer for newspapers. He also worked for the Aboriginal Peoples Television Network (APTN) as a writer and researcher. In 2014, he began working for CBC Radio in Manitoba as an associate producer before becoming the head journalist for their Indigenous unit, a position he held until 2017. Fontaine, a member of the Sagkeeng First Nation in Manitoba, now lives in Winnipeg and can be seen on the APTN’s weekly satirical news and talk show The Laughing Drum. As a journalist for two decades and working in comedy as a founding member of the live comedy group The Crow Hop Café, the merging of his two passions seemed like a natural progression in Fontaine’s career. He feels that his site is a beneficial addition to Aboriginal news. One of the reasons he was asked to speak at Carleton University was because of his popularity with the young Indigenous students there. But he said his articles are also popular with the older crowds who are more familiar with past political issues. Fontaine said although the articles on his site are mainly written for a Native audience it does have a substantial non-Indigenous audience. 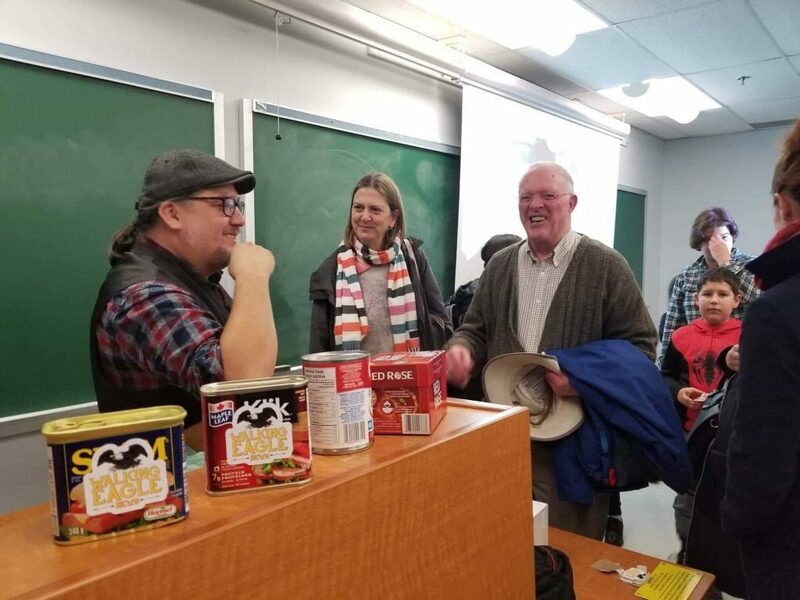 He had the impression that a large portion of the Canadian population was not aware of Aboriginal issues and he hopes his site can help bring some of those topics to the public. “A good story will get about 20,000 readers. It’s people from all sides of the political spectrum. Lots of Indigenous people, lots of non-Indigenous people. Lots from Canada,” Fontaine said. Although the Walking Eagle News is meant to be a positive medium promoting awareness with a sense of humour, there are those critical of its comedy and Fontaine does receive complaints about his site. “Some people don’t like it, but they still follow it. I think they like that it makes them mad,” Fontaine said. But Fontaine says he doesn’t intend to anger anyone. There are some readers who don’t realize that his articles are works of satire and mistake them for real news despite the disclaimer. “I grapple with that, whether it’s actually helping or hurting things and causing fake news and misinformation,” he said. For the most part, Fontaine feels his site does more good than bad and helps to keep Aboriginal issues on people’s minds. Fontaine has a crowd-funding campaign on Patreon that has so far raised about US$1100, which he calls a “tip jar.” He said he is proud that people are willing to give him money each month to continue doing his website. Re-runs of the first season of Fontaine’s show, The Laughing Drum, can be seen on APTN as well as on YouTube. The second season begins shooting in January 2019. He also has a documentary series on the same network that is currently in the works.